Miss Priss has been on a cooking bender. I think she fancies herself a future Chopped Junior contestant. I was getting tired of monitoring the kitchen with her, so we moved over to no-bake recipes. I don’t have to be by her side the whole time, and she still experiences all of the joys of cooking. She is also gaining measuring skills, the ability to read and follow directions, and learning how to clean up after herself (my favorite side benefit). She has no idea she is actually learning these valuable skills, and I am not planning on revealing this little secret. 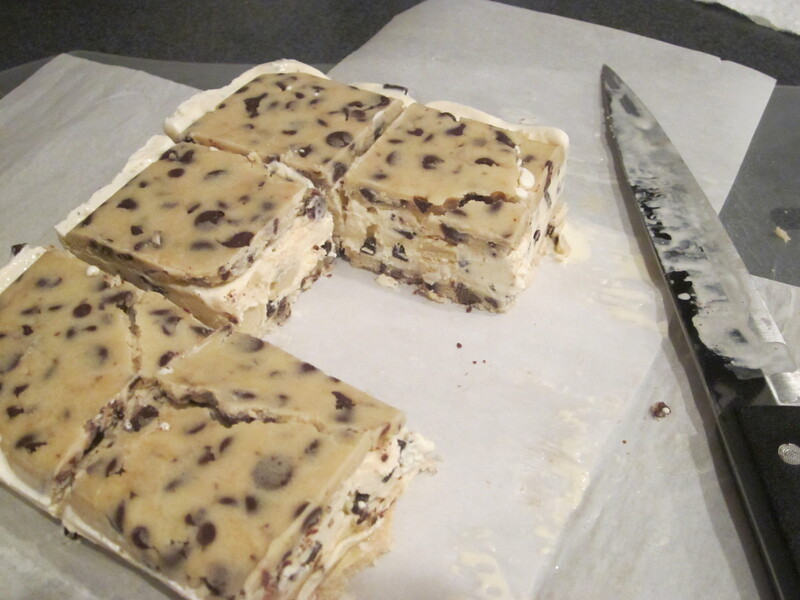 The best recipe she has made so far is a chocolate chip cookie dough ice cream bar. I found the original recipe and directions HERE. I helped cut the parchment paper to the correct size, and I licked the bowl, but other than that, I had no involvement. 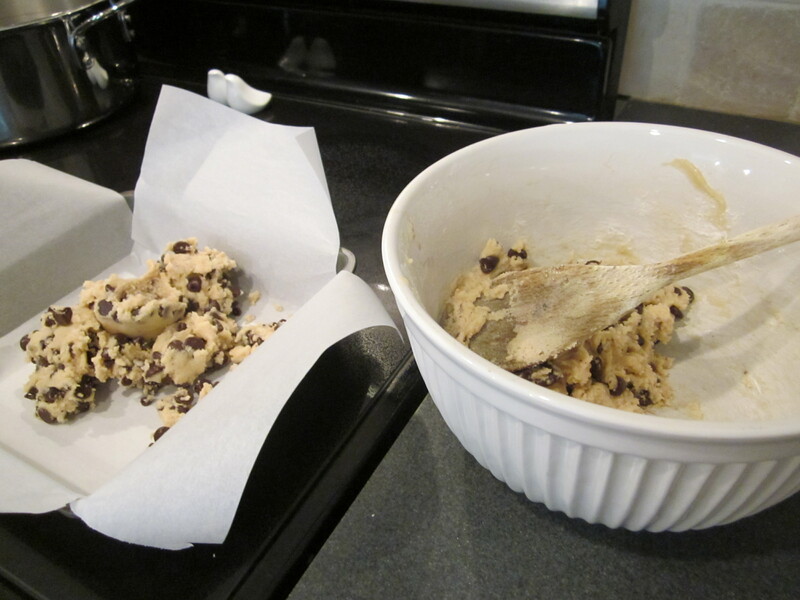 Prepare the eggless cookie dough batter (CLICK HERE for recipe). Line a 9 x 9 pan with 2 pieces of parchment paper strips. Put one strip horizontally across the pan and the other strip vertically. The ends of the strip should hang over the edges of the pan. This will allow you to lift the frozen cookie dough out of the pan later. 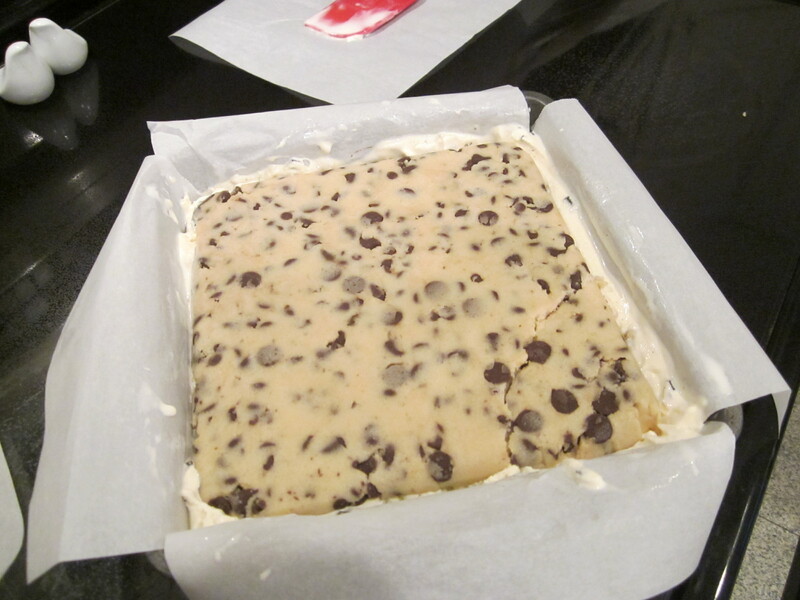 Press half of the cookie dough into a thin layer on the bottom of the parchment paper lined pan. Put two new strips of parchment paper over the layer of cookie dough and gently press and smooth the paper. Spray lightly with Pam or another cooking spray. 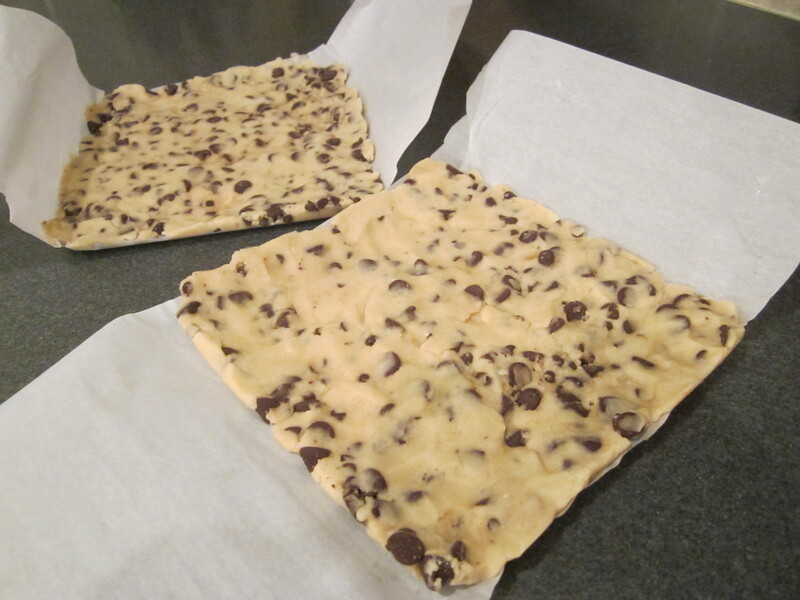 Press the other half of the cookie dough on the second layer of parchment paper into a thin layer. 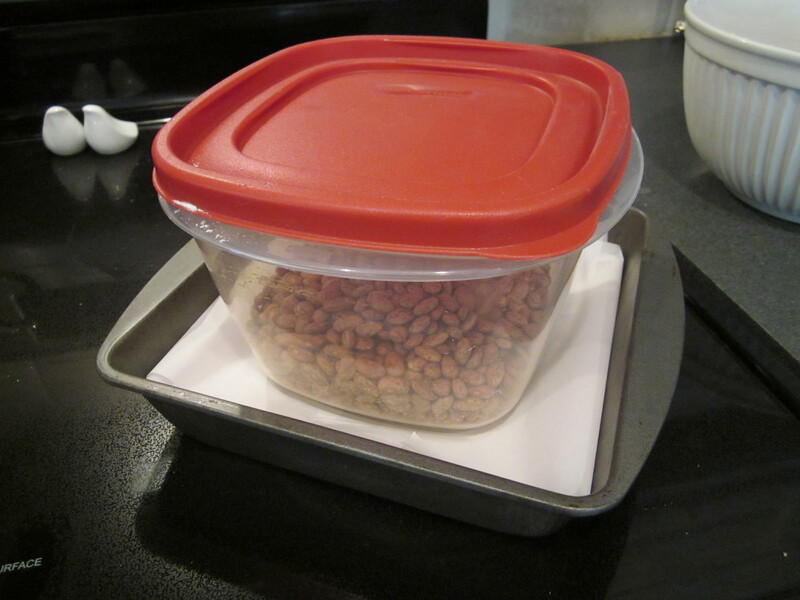 Fold the parchment over the top and put a weight on top to hold the parchment paper down (you could use a tupperware/bag of dried beans, bag of frozen vegetables, or something else in your freezer). 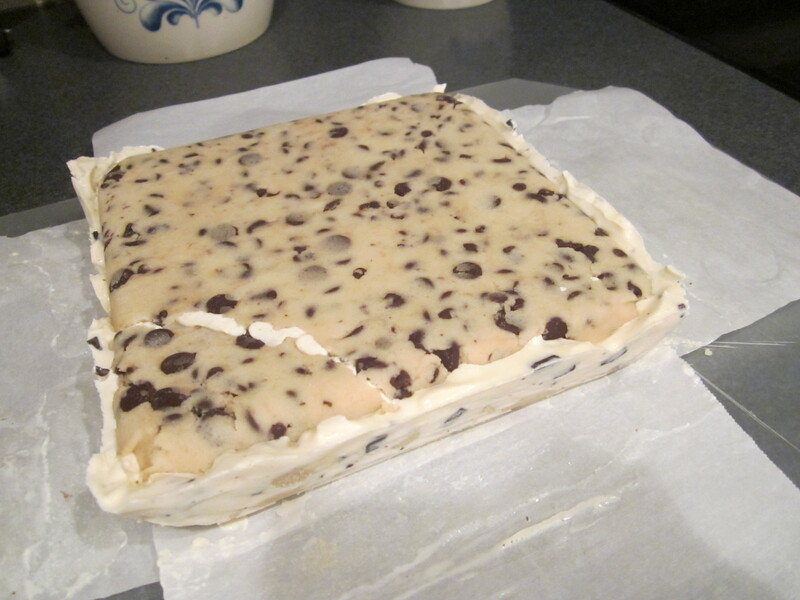 Gently remove frozen cookie dough layers from the pan and peel from the paper. Put two of the strips of parchment back in the pan and gently place one cookie dough block back on the paper in the pan. 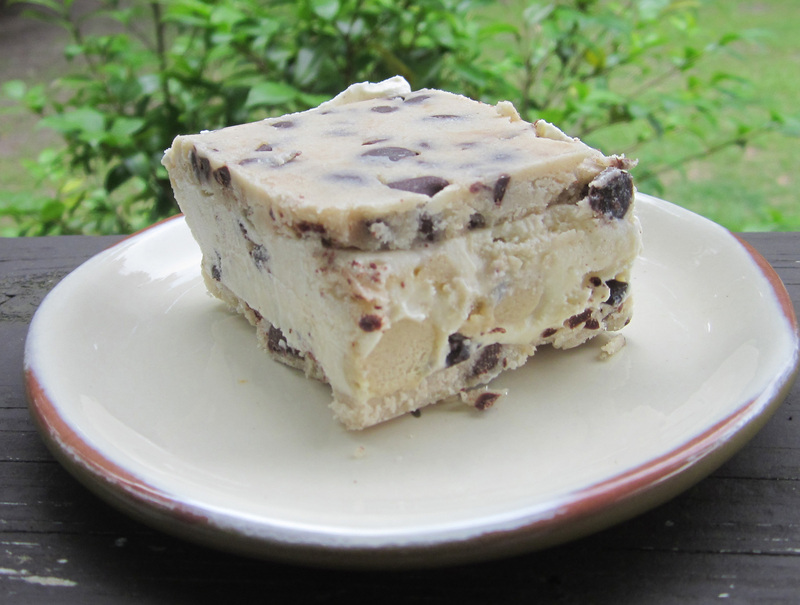 Gently spread one quart of softened ice cream over the cookie dough base. 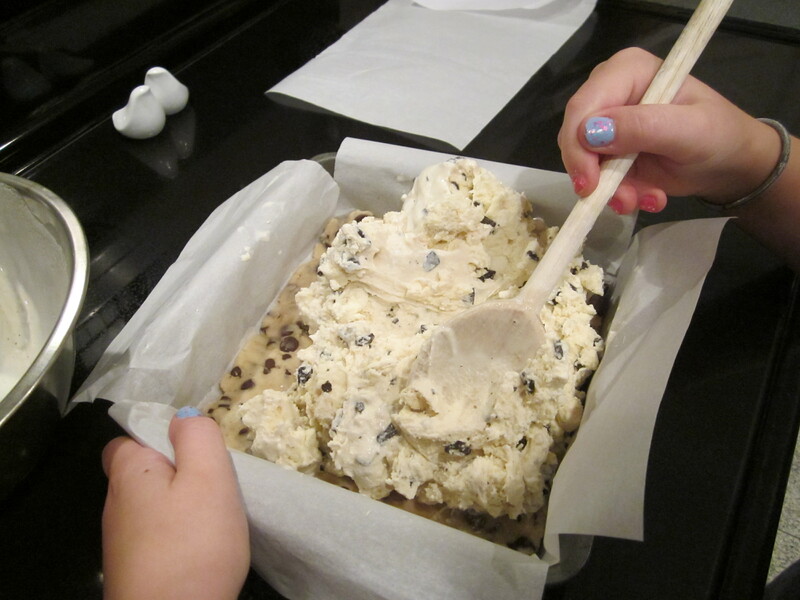 Place the second cookie dough block on top of the ice cream. Cover with a strip of parchment. Place a weight on top (dried beans or bag of frozen vegetables again) and put back in the freezer for 2-3 hours. 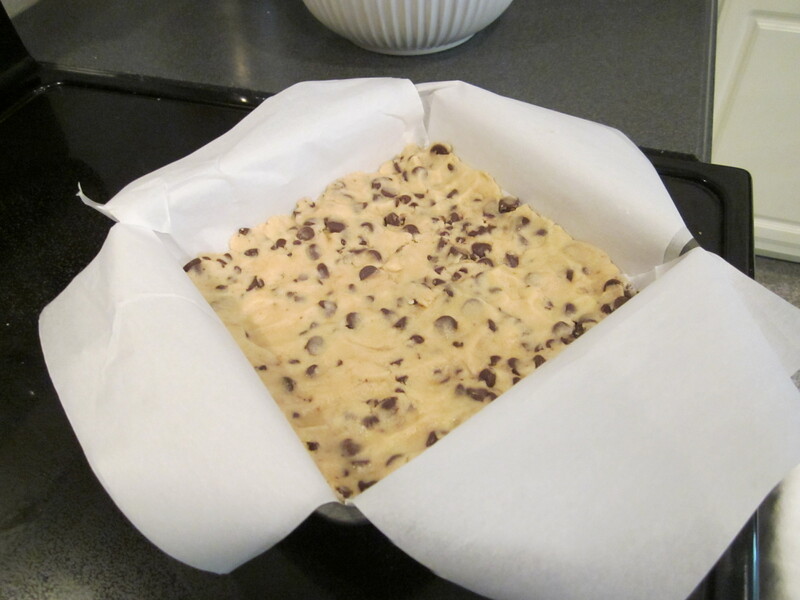 To serve, lift the cookie bars out of the pan using the bottom layer of parchment paper as a handle. Cut into squares with a sharp knife. Running the knife under hot water before using it to cut will help make slicing easier. 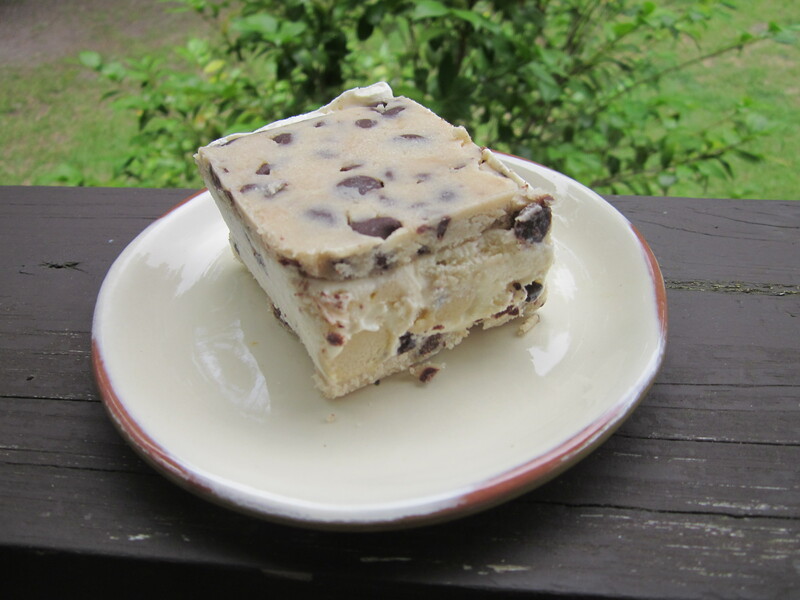 OK– so I helped with this step too, and the cookie dough “crust” breaks very easily.